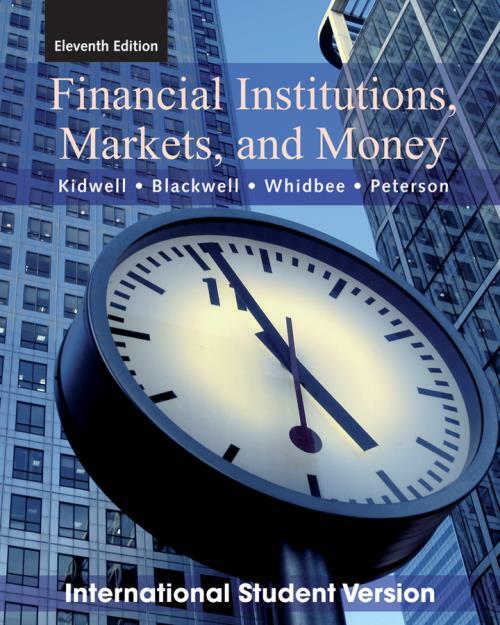 th Edition presents a balanced introduction to the operation, mechanics, and structure of the U.S. financial system, emphasizing its institutions, markets, and financial instruments. The text discusses complex topics in a clear and concise fashion with an emphasis on "Real World" data, and people and event boxes, as well as personal finance examples to help retain topical interest. Each author brings something unique to this new edition. David Kidwell, formerly Dean of the Carlson School of Business, is a gifted storyteller with a keen insight on what it takes to reach readers. He is also currently writing a Corporate Finance text and is Chair of the Finance department at Texas A&M University. David Whidbee is an Assoc. Dean at Washington State University. He has won numerous teaching and research awards. 4.1 What Are Interest Rates? PEOPLE & EVENTS: What Do Negative Yields on TIPS Tell Us? 10.1 What Are Equity Securities? PEOPLE & EVENTS: What′s Your Score? PEOPLE & EVENTS: WaMu and the Destructive "Power of Yes"
PEOPLE & EVENTS: Dual or Dueling Banking Systems? PEOPLE & EVENTS: Where, Oh, Where Have All the Investment Banks Gone?